‘X – No Absolutes’ is Prong, (who were formed nigh on 30 years ago by guitarist and vocalist Tommy Victor in 1986), at their very best. The sheer intensity and ferocity of the album’s opening triumvirate ‘Ultimate Authority’, ‘Sense Of Ease’ and ‘Without Words’ leaves the listener gasping for air. The title track is crunchy and catchy at the same time, while ‘Do Nothing’ may be as close as you will ever hear Prong get to a ballad and shows the enormous progress and confidence Victor has made vocally. It is hard to find a weak spot here; notably Victor mentions that “Sequencing the album was a difficult task; every song is so strong in its own way”. Again produced by Tommy Victor, this time with trusted collaborator Chris Collier as co-producer and engineer, “X – No Absolutes”, which is packed with the band’s trademark driving riffs and pinpoint-precise grooves, also broadens the horizon sonically. 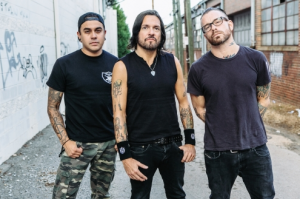 Just days after the mixing of ‘X – No Absolutes’ was completed, Prong went on the road with Danzig and SuperJoint Ritual in North America and released the first single from the album, ‘Ultimate Authority’ on 2nd October, the day the tour began.